This example demonstrates how you can connect your Windows Forms or WPF Application written in C# to an IP camera with motion detector. On this webpage you can also find detailed information on how you can register your program to a PBX and make an alarm phone call using prerecorded voice if the camera goes offline. To implement this example, you need to have OZEKI Camera SDK installed, and a reference to OzekiSDK.dll should be added to your Visual Studio project. 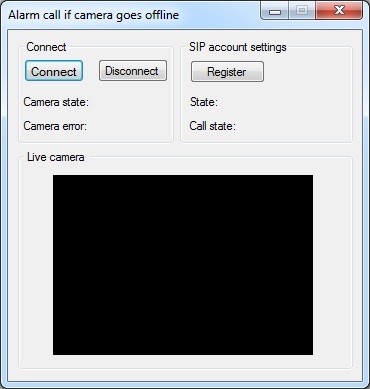 How to detect if a camera goes offline, and how to make an alarm phone call with prerecorded voice using C#? To establish the connection properly between your application and an IP camera you should apply the same code snippet what you have used in the example (How to connect to an IP camera device using C#?). Important: you should study this article in order to find out how to setup your Windows Forms/WPF Application correctly. Please visit the How to handle alarms, by making a VoIP phone call article before you begin to study this function. After the successful implementation of the functions and the GUI elements, the application will work properly. Pressing the connect button will load in the image of the IP camera device connected to your PC into the panel that you can see on the picture. When the motion detector detects motion, the motion label's text will become true. If the SIP account registration was successful the program will call an alarm monitoring center. Below you can find the code that belongs to the interface of the previously presented application. With the help of this section your WPF will be able to work properly. DISCLAIMER: Please note that the following features will only work if your IP camera supports the given function. You should check the user manual of your IP camera to make sure it supports the feature that you wish to implement in C#. Make sure that you have a file named "alarm.wav" on the proper location. My audio is not played. Why? Make sure you added a .wav file. At camera error I did not receive the call. Why? Please make sure that your PBX is configured properly. You should check whether the dialed number is valid. Please make sure your registration data are valid. You should make sure that the camera is not covered and whether the room is too dark.